Over $2,000 value a great offer! Some Of The exceptional Talent Stacey Guides Through Her Flexibility System In This Package Series. Before & After Results 1 Session From Talent During Filming These Courses In The Dance! 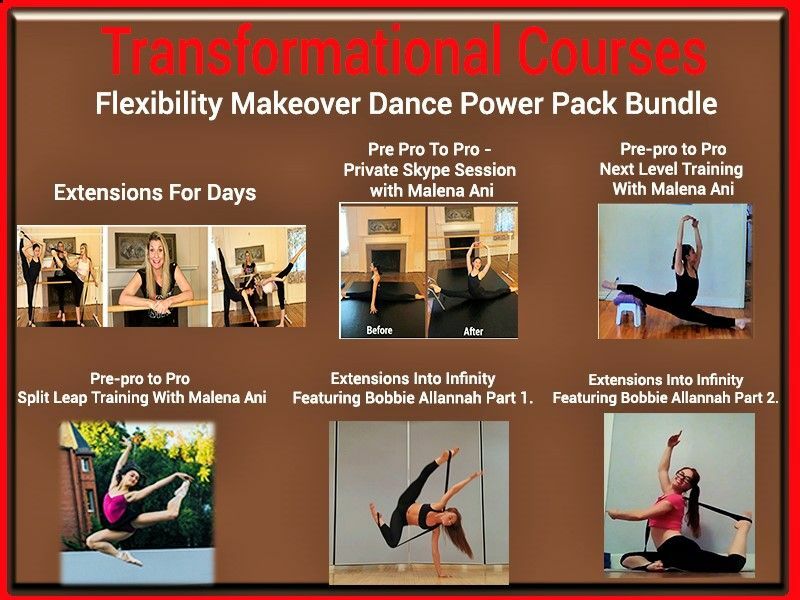 Flexibility Makeover Power Pack Series. These are not even all the results! This could be you. Ready to move past stuck plateaus? Stacey 's Flexibility Makeover Programs are Raw and Real..Just like the Results! with Naomi who is 11 years old. She was competing in Rhythmic Gymnastics and now has been cast in La Sylphide with the Los Angeles Ballet. This has a 2 part series with 2nd complete bonus course this series following Naomi's Flexibility Journey as Stacey continues to guide her, you too can now have access to the magic that happens behind the scenes. Just added "Flexibility Makeover with Top Female High Diver" Lysanne Richard who is a Red Bull Cliff Diver & Cirque du Soleil Performer. This includes a bonus 33 minute warm up for her to do pool side to warm up before critical competitions & performances. Stacey guides her to clear a previous neck injury and improve hamstring flexibility for pike dive. Focus is also on improving back arch. There's more!! 2 Filmed Private Filmed Skype Session with Synchronized Swimmer (Flyer) Jessica Sobrino Member of the National Team – Team Mexico – Central American Champion Pan American Champion @jessicasobrinoo on route to Olympics in Tokyo In this session the focus besides over-all flexibility is she needed to improve splits, toe point and back arch to be able to score as high as possible! Preview of how Stacey sets the tone to get the most out of her flexibility programs!